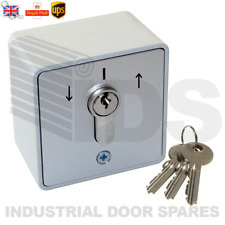 16 AMP IP54 Industrial Roller Shutter Surface Mounted Door Key Switch. ROLLER SHUTTER SPARES. THRESHOLD SEALS AND RUBBERS. The manufacturer's warranty does not cover any product or part, which has been subjected to misuse, abuse, modification, negligence or accident, nor does it cover any product, which is used for any purposes other than for which it is intended as stated in the specific manufacturer's product information literature. Key operated changeover switch. Keys are removable in both positions, and available in random profile. Weatherproof covers are available for these switches. 2 Keys are supplied with each switch. When we have received the item back it will be checked to confirm the fault. 1 x ROLLER SHUTTER IP54 - 16 amp KEY SWITCH from GEBA. Suitable for roller shutters and roller garage doors. Certified to be water and dust proof. Spring load safety feature. 3 x keys supplied. Designed for use with any security system requiring an external switch. Includes cylinder, ring hex nut, 2 screws and 2 keys. Protect sensitive circuits with this on/off key switch. When we have received the item back it will be checked to confirm the fault. Supplied with Two Keys. Colour: Nickel. Heating & Cooling. Stand & Cases. A key operated switch To mount to panel the switch block and the key body pull apart and then re-assembled when the key body has been fitted to the panel. Key removable in Left & Right possitions but not removable in the center possition. Techna PtecMetSN2F 2 Position Metal Selector Switch. 5x Key lock set. For sale are for 5 Key lock set. It functions like a basic on/off switch but you can only use it with the key. 6- "NEW" (OEM) - P&S 500K Switch Keys. Our LATCHING Keyswitch is fitted in a stainless steel plate and built into a shrouded, high-impact plastic back box and is supplied with security screws. It is suitable for surface or flush mounting with the provided screw footprints. The Stainless Steel faceplate is an easy clean surface and can handle more than 1 million operations, making it a good fit for public areas and hospitals. Two keys are provided with this latching key switch which can be removed in either the on or off position. 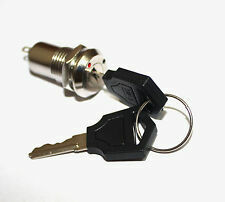 Examples of use for a keyswitch of this type is to keep magnetic locks open for prelonged periods, or bypassing alarm detecors without unsetting the alarm. Main features Functional and easy to use design Latching On/Off operation Key removal in both on and off positions Supplied. A Heavy Duty on-off switch. Switch type: key switch. Features: the key can be removed at limit positions. Body material: zinc alloy. Key can be taken out when the switch is in the ON or OFF position. 1pcs Key Switch. You will receive. O ALUMINUM DIE CAST ENCLOSURE o CYLINDER: MORTISE TYPE (5 PIN). o NEMA 3R, 4, 12. o SURFACE MOUNT. All warranties are provided by the product manufacturer. We provide the courtesy service of facilitating your claim with the manufacturer. 3302-2, all keyed alike,, 2 keys per lock. 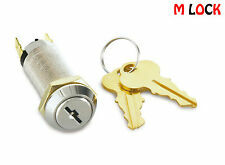 Main lock material: Zinc alloy housing & barrel. 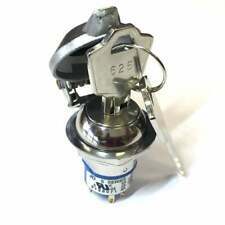 Two wire ON/OFF switch with round barrel type key or Ace key.I have 10 available for buy it now. New boxed in original packaging. This Key Switch has 2 Maintained Positions: OFF ~ & ~ ON. The Key can be pulled in EITHER the ON or OFF Position. 3/4" (0.750") Round Hole Mounting, Panel Thickness up to 3/4" (0.750"). 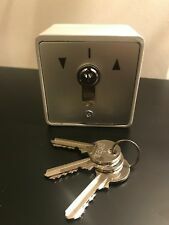 TWO HIGHER-SECURITY DIMPLE KEYS. This key switch is typically used with security systems / alarm panels (although it can be used for many other applications). This key switch IS spring loaded (i.e. it is NOT maintained . ). This CamdenBoss E-Stop box is from the CSCI range. The assembled E-Stop is supplied in a plastic body with a red actuator. During that process you will be issued with an RMA number. Key release. Robust ABS body.